Have you ever wonder that we can create amazing spa and massage website with WordPress, yes there thousands of salon wardress theme available with stunning features with each. But to consider they all having advantages and disadvantages with each. We have accurate analysis to find the best spa and salon WordPress themes with feature lists. If you have an idea to make your own beauty WordPress website or any idea to make a website for client this list of WordPress theme will be really helpful, so keep reading and select the best theme as per your requirements. The Spa and massage salon WordPress theme will allow promoting your wellness, SPA, beauty, meditation, yoga, and salon with WordPress. The list of WordPress theme which listed bellows includes the detailed set of features and control to make easier to select your suitable theme as per your requirements. Additionally, all the themes are 100% mobile responsive and fully customizable as you need. Meanwhile, the themes having stunning looks and layouts that audience will love to visit your website often. It has included all the necessary feature and essential techniques which each salon WordPress themes consists. When you having beauty and SPA website with your own, your place and showcase your products and services clearly to the target audience. By considering all the factors we have done the deep analysis on how to select best Spa & massage salon WordPress themes for your business. Attractive health & beauty WordPress themes for stylish sap and beauty WordPress websites. It has creative and advanced layouts design with responsive navigation that shows accurate display and resolution on several devices. 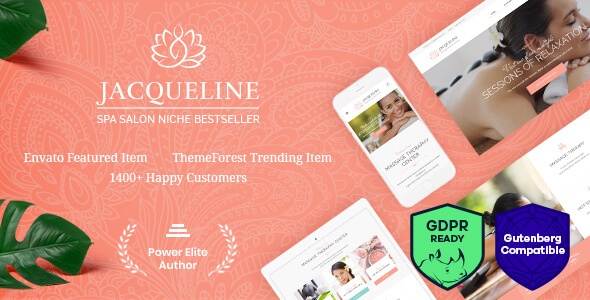 Jaqueline will highest and right solution for making an awesome website for salon, beauty, spa, massage, hair and makeups. All the pages and layouts are tested and valid codes that you can optimize and rank additionally, meanwhile greatly support for WPBakery page builder which is number tool for making creative custom pages with own and without any coding knowledge. All the time its support for importing demo content to your website, where your website will be ready under one minute. That’s really pretty awesome as other premium themes provide. Tons of short codes that you can generate additional widget and pages without limited along with powerful admin theme options panel, which provides countless features to make the stunning website with drag and drop features. Start selling your product and services by your own by creating a shop page, great support for WooCommerce plugin that can simply integrate your website that allow you to sell you item on your website. The unlimited WordPress theme for making a salon and spa, massage and wellness websites. Nice location to showcase the galleries such as resorts, spa, beauty, yoga, holistic, and other health related posts. Ability to edit and customize easily without any further programming knowledge under simple customization features. 10+ portfolio layouts allow to change and update at any time for suitable layouts for your website. Additionally pur team provides dedicated supports and free lifetime updates for real users, as well you can test theme for 30 days with money back guarantee. Powerful theme option panel to control your website accurately with stunning feature lists. Drag and drop page builder that you can make awesome looking pages to lead the development speed faster. Translation ready theme that you can install WPML plugin to improve the website usability among visitors, as well as it support for most popular and essential plugin to increase website readability such as WooCommerce, slider revolution, premium icon and beaver builder. 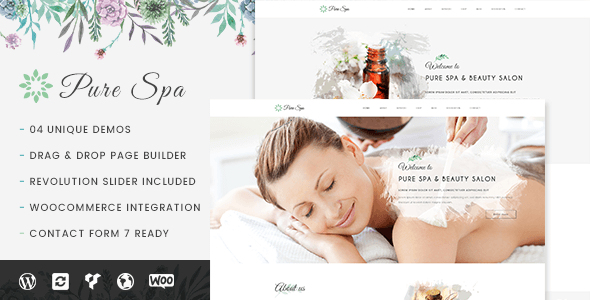 Perfectly responsive spa and beauty WordPress theme for making awesome website such as wellness, massage, spa and more, that allows to make your business more polish and accurate with their pre-built layouts and design. Really flexible theme with responsive design for all devices includes mobile, tablet, desktop and laptop. It also come up with 4 different and unique demos to check the process and functionalities to before start the actual development, each demos are applicable for Spa, beauty, massage and yoga. All the pages and layouts are control under advanced theme option panel, the best place to make your theme more engage with simple steps. Start selling your product in online with WooCommerce plugin, with minimum requirement and sources. Pure also ensuring to install and make the website under one minute by installing demo contents. All the codes are cleanly tested and properly format to speed up the website performance and editable and customizable easy as per your requirements. 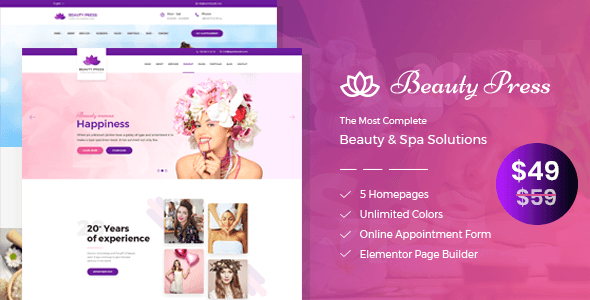 Responsive and clean WordPress theme all kind spa, beauty and massage websites. It has more than 40 pre design pages and layouts that you can get experiment with it. Specifically grand spa focus on creating the compelling pre design page for spa, massage and beauty website that can instantly speed up your business and visitors to your website. The great feature of this theme is booked plugin, which allows creating your booking and appointment page without any additional cost. And sell your products online with WooCommerce plugin. Additionally, 8 pre design templates for photo gallery to showcase your portfolio and various images galleries. Different types of parallax effect to attract your visitors such as video background, scrolling and more. Moreover, one click for import your demo content to website under one minute which includes your post, widget, sliders, pages and more. A beautiful spa WordPress theme with 5 different and unique demos with clean and responsive design especially for spa, beauty, massage, medical, wellness center and cosmetic shops. It has tons of features and that improve the website functionalities such as 5 homepage design, unlimited colors, appointment booking, and more to come. All the pages and layouts are developed with valid codes and formats that developer can easily edit and customize as their needs if needs, but since it supports for Elementor page builder no need to touch any codes to make any changes on your website. Simply use the Elementor plugin to make the awesome page with drag and drop features. 100+ short-codes will give an extra boost to your website, make use of all the recommended short-codes and get the difference. Its uses smooth animation, illustration, and navigation to improve the user experience to engage more new visitors. Compatible with WooCommerce plugin, start selling your products and service online and make full income. 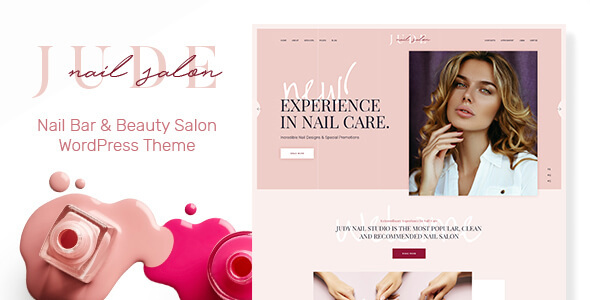 Jude is a modern and fresh WordPress theme for nails, beauty salon and any kind spa services. Nicely locate layouts and design carefully which allows to showcase and promote your portfolio and galleries. Additionally, jude also provides powerful plugins such as WPBakery plugin for visual page builder, attractive slider revolution to make the stunning slider in homepages. As well support for essential grid plugin to make awesome grid layouts that will definitely look great and compatible with Instagram feeds. As well as allows to import demo content to your website under one minute with super easy steps. Absolutely optimize with all the devices including swipe effects, revolution swiper and responsive & retina ready. Powerful admin panel options provides easy to make pages and post with drag and drop features. In the other hand its support for include WPML plugin to make your website multilingual support. 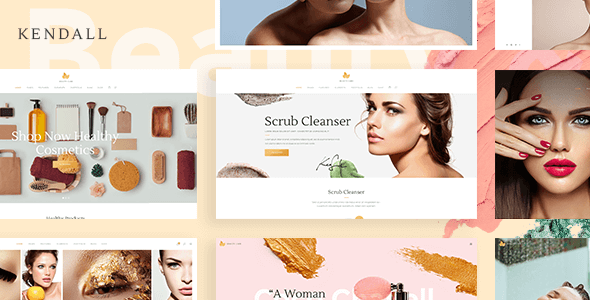 Modern WordPress theme for spa and salon website with the ability to arrange an online promotion for your business such as spa, salon, and beauty. As well as this also applicable for the massage therapist, chiropractic agency, orthopedic doctor manual therapist and more, so almost it is a multipurpose WordPress theme for health and beauty area. To make high quality and stunning web page, its offer WPBakery page builder that allows creating your awesome looking website on your own without any coding knowledge. Likewise creatively make your home page by adding a slider, support for slider revolution plugin and sample demos. And more plugins such as WooCommerce, essential grid, and book appointment. Easily import the demo content to your website simple by one click and under one minute your website will be ready to launch. Optimize with all the devices and responsive design. Additionally, its support for 100+ short-codes to generate custom widget and features. Make your website multilingual by integrating WPML plugin. Specially design for every hair and beauty salon website. This theme includes lovely features that will highly apply for beauty, salon and spa website without any additional developments. Likewise, showcase the portfolio and galleries in a recommended position. 12 different types of home demos available you to check before the development begins. And import the demo content if need with the simple one click.